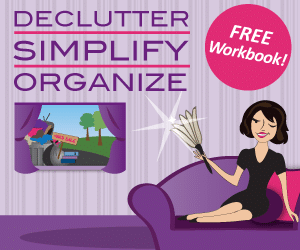 Do you want to declutter but often find yourself worried about where to start? Decluttering is a process—and sometimes it’s easier to do it with small, incremental changes rather than all at once. You can give yourself a positive boost of energy by setting yourself up with measured, achievable tasks. Here are some decluttering “quick wins” that you can complete in a matter of minutes. Got dirty laundry? Don’t just do a load of laundry, but also consider each item as you throw it into the wash. If you don’t want it anymore, either throw it away now or make a mental note to set it aside for donation later. It’s easy for even clean laundry to pile up. If you’ve gotten into the habit of never putting away your clean laundry, now is the time to do it. Folding and hanging your laundry only takes a few minutes, but it makes your home look far more organized—and ensures that your laundry takes up far less space. Old mail has a tendency to collect. Go through your home picking up any old mail, flyers, and loose paperwork, and give it a once over to make sure you aren’t throwing away anything important. Everything you don’t need gets tossed into the recycling. Here’s a small, manageable task: empty out your junk drawer. Take everything out of it, throw away the things you don’t need, and put away things that have a better or more appropriate place. Everything that remains can be tucked back in, like the batteries and the zip ties. Are the trash baskets in your bathrooms, bedrooms, and office getting full? It’s easy to neglect household trash baskets even when you’re taking care of the trash elsewhere, such as the kitchen. Empty everything out to refresh your rooms and make them feel less cluttered. Have your dining room table and coffee table collected things? Plates, glasses, paperwork, and other items can slowly clutter up your surfaces. Take some time to clear your tables off, putting all the items in their proper place. It will only take a few minutes and it will make a noticeable change. If it’s been a while since you’ve cleaned out the fridge, you could have all sorts of items cluttering it up. Open your fridge up and take out everything in it. Wipe down the shelves and drawers and then put everything back, checking the expiration dates as you go. You may even find some things you need to use up fast! Is your counter space getting limited? Move any items that shouldn’t be on your counters and give your counters a good wipe down at the same time. Often appliances you don’t use very often can end up on the counter and stay there indefinitely. You can put things like spices away on the spice rack and organize the spice rack at the same time. Like the refrigerator, the pantry can collect old, unused items that really don’t need to be in there. Organizing your pantry and throwing out old things is also an excellent way to remember what you actually have. You may find yourself starting to plan a meal as you organize! If you want to start decluttering but don’t have the time to do your entire house, your bathroom can be a good place to start. Bathroom cabinets, shower caddies, and shelves tend to collect products that have expired or are never going to be used. Empty your bathroom out of items that you don’t need. You’ll achieve decluttering one room without having to invest a lot of time. Time to go through the closet and the drawers. If you have a lot of clothes, the time may have come to get rid of some of the items that you just don’t love anymore. Not only are these items taking up space, but they may also be making it harder for you to get dressed in the morning. If you have seasonal clothes that you still like but aren’t wearing right now, consider placing them in storage until you need them. Every item you own is a weight on your mind. Decluttering, even if done in small ways, can reduce your mental burden and make it easier to focus on the things that are important. You can get on the path to a stress-free life with Get Organized Wizard! This entry was posted in Clutter, Home Organization and tagged clutter, organizing, peace of mind, quick wins.